Author Armistead Maupin was in the Twin Cities last week speaking at the wonderful Pen Pals, an author lecture series that raises funds for the Hennepin County Library system. I’m sure that when they booked him for the event no one knew that it would coincide with the passage of the bill that made Minnesota the twelfth state to legalize gay marriage, but his appearance last week couldn’t have been more timely. Maupin is the author of the beloved Tales of the City series that began as a newspaper column in the 1970s, first in a Marin County paper and then in the San Francisco Chronicle. Much the way Charles Dickens’s work appeared in serial installments, each Tales of the City column delivered a new episode in the lives of a quirky and sometimes bizarre collection of transsexual, straight, and gay characters who reside at the fictional 28 Barbary Lane, San Francisco. The series grew into eight best-selling novels, a television miniseries, a film and a musical. Maupin was one of the first openly gay authors and his stories were ground-breaking in a time when there were no gay people in popular culture. I was thinking as he spoke about how much things have changed, particularly in light of Minnesota’s new marriage law. His conversation was peppered with a few “motherfuckers” and some colorful comments about his sexual behavior. I wondered if such in-your-face speech seemed a bit dated, unnecessary in the era of Ellen Degeneres and “Modern Family” when gay people are more part of the mainstream. That was Friday. Then Saturday night in New York’s Greenwich Village, a gay man was murdered in what was clearly a hate crime. So, that answered my question. 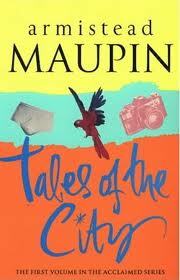 Maupin’s attitude and his stories are as pertinent as ever. When he started writing there was the homophobic Anita Bryant. Now we have Rep. Michelle Bachmann. Maupin’s groundbreaking stories incorporate the politics of the 1970s but also focus on universal themes of love and longing that have made the “Tales” endure over the decades with broad appeal. Maupin says, “We read to feel less alone, to find our experience reflected in that of others.” I would add that reading opens our minds to the the experience of others even if it isn’t the same as ours. The best thing about reading: it fosters empathy. For anyone traveling to San Francisco, the Tales are a must read and Maupin’s web site offers a great map to the real places that you read about in the books. That reading and travel combination gives insight into the city’s history not only as ground zero in the gay rights movement but also its position as the America’s foremost place for iconoclasts–the Beats, hippies, immigrants from around the world, and cultural and spiritual seekers of all sorts who have changed the way we think and influenced our culture.